Found: a Commodore C65 Classroom Prototype #VintageComputing #RetroComputing #Commodore « Adafruit Industries – Makers, hackers, artists, designers and engineers! Via Steve Gray on 6502.org, last month surfaced pictures of a C65 variant called the C65 Classroom Computer. Revealed in December 2018 by Fred Bowen on the Commodore International Historical Society Facebook group. Little is known of it at this point, but externally it is a C65 with the drive section chopped off. On the back there is a DB25 female which could be a serial port and a DB-15 that could be an RGB output, or perhaps an ethernet port. On the side are the same ports as the C65. There is the power, two joysticks, and a reset button. Moving to the motherboard there are two big sockets for custom chips. We don’t know yet if they would hold the same chips as the regular C65, probably CPU and VIC-III. There is no smaller square socket for the floppy disk controller chip. Since there is no drive this makes sense. There is an expansion port that looks the same as the C65’s, but no cutout for it. There is no internal trap-door expansion but there is an unpopulated header there that could be for the same or similar purpose. The PCB has an unpopulated port, also without a cutout that looks like it could be a standard C64 video port. Also on the inside is the keyboard connector like the C65 and another connector beside it that looks like it could be for a C64-type keyboard, or possibly is for accessing the joystick ports. There are two regular rectangular sockets. One looks like a SID socket (given the placement of two capacitors directly beside it), and the other most likely is a ROM socket for the firmware. In fact, there was the “1565” External drive, which was prototyped as well (seen in the picture at the top of the page). This “Classroom” C65 is obviously an entirely different product designed for a different market. The “Diskless” C65 would most likely be a simple case modification and would likely use the same motherboard as the “regular” C65. 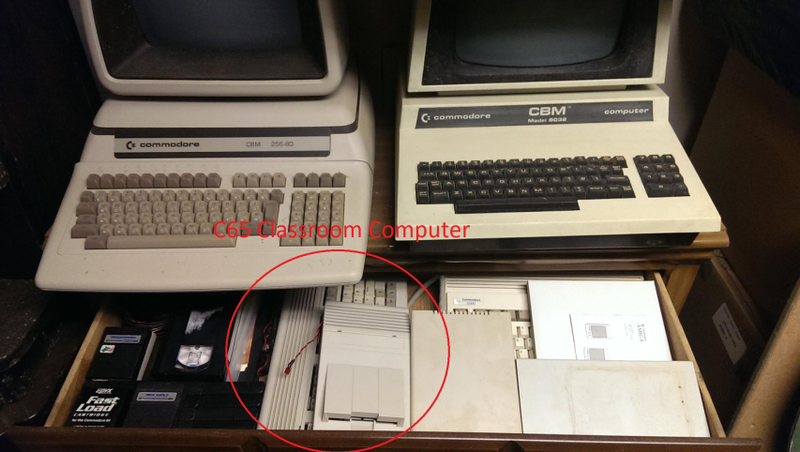 The “Classroom” C65 has no floppy drive controller on board, no user port (probably), no sound connectors. It was designed to be very minimalist and inexpensive. It would make sense for this to use the “Diskless” case since it’s pretty much the size of the keyboard itself.